Colm Eogan had just bought a house with his partner and two kids shortly before the crash. 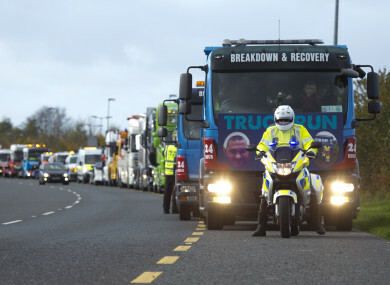 ON 12 JULY this year, Colm Eogan attended the scene of a car breakdown on the M3 motorway between Dunshaughlin and Navan. The company he works for – JS Motors – would regularly be tasked with attending cars in Meath. He put the two people in his tow truck and went to tow their car, when he was hit by an articulated lorry. Elaine Dixon is maintenance manager on the M3 and was one of the first on the scene. She told TheJournal.ie that Eogan suffered horrific injuries. Only 43-years-old, Eogan had recently bought a house with his partner and their two kids. Colm with his partner Jacinta, son Noah & daughter Sky at yesterday's event. Eogan has been in hospital since the incident, and will spend the next few months there. Friends and family have rallied to try to do their bit to help Colm and his family. “His friends did a golf classic, a table quiz and other things,” Dixon said. There was a major fundraising event yesterday, with his employers JS Motors helping to organise a massive truck run down the M3. At the time of writing, the GoFundMe page set up for Colm has raised just over €8,000 of its €25,000 goal. Read: GoFundMe appeals are more popular than ever. How are established charities competing? Email “'He should be dead': Fundraiser for recovery operator who lost limbs after being hit by truck on M3”. Feedback on “'He should be dead': Fundraiser for recovery operator who lost limbs after being hit by truck on M3”.